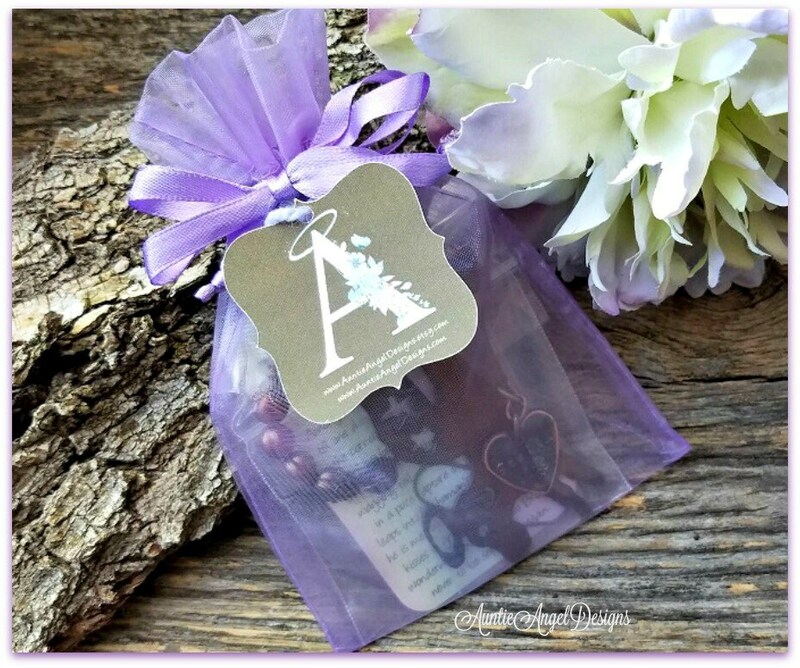 The "Rainbow Bridge Angel Kitty Ornament" is a unique and exclusive beaded piece by Auntie Angel Designs for a great year-round pet sympathy gift. 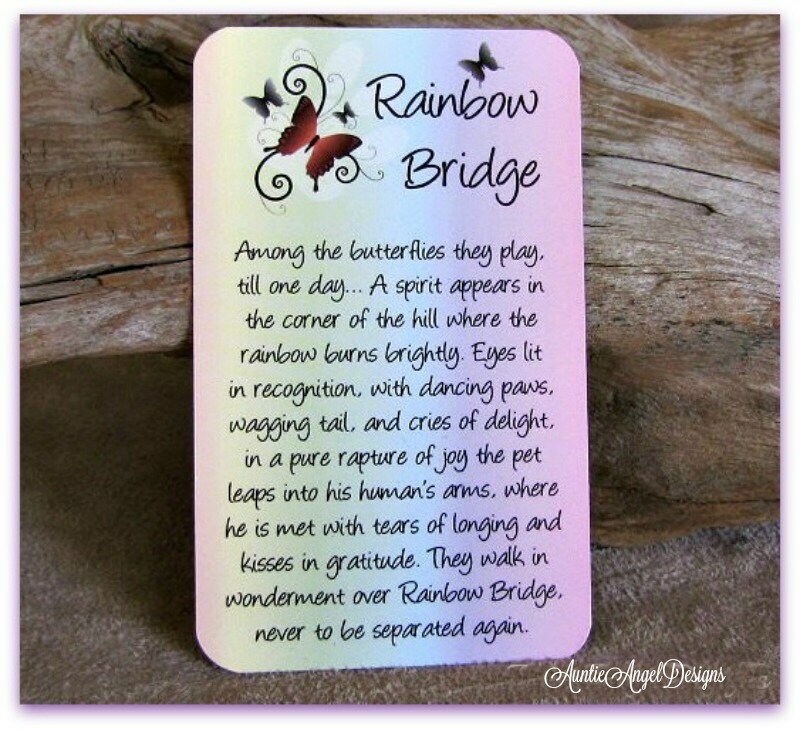 This gorgeous, yet simple Rainbow Bridge-inspired piece is meant to remind you always of your precious angel kitty at the Rainbow Bridge, knowing one day you will be reunited. 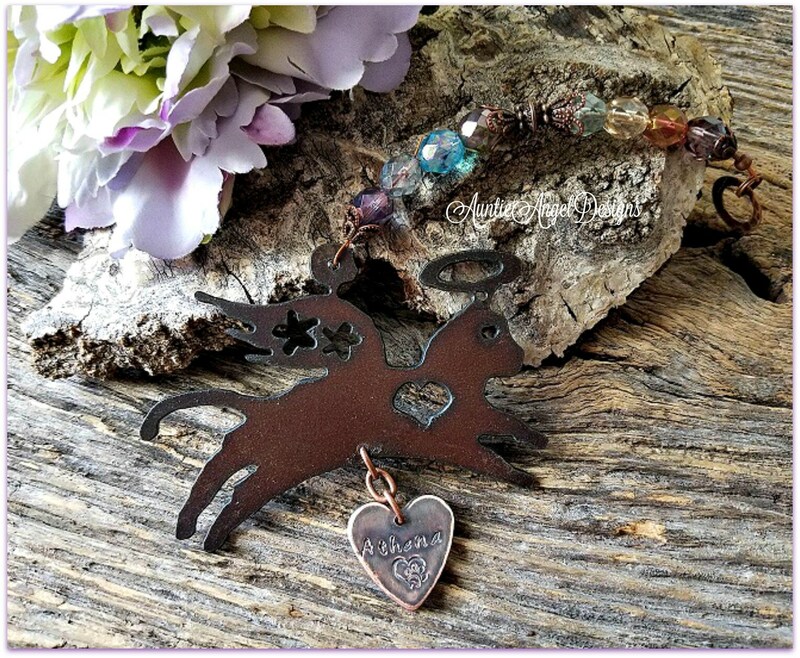 Each rustic 18-gauge metal angel kitty cutout is approximately 3" wide by 1-1/2" tall with the thickness of about a quarter. The rustic metal cat cutout dangles from a strand of soft crystal-faceted beads in colors of the rainbow. The beads are in a luster finish and are quite beautiful when in the light, like next to a window. Each piece is strung on flexible wire and finished with fine filigree antiqued copper bead caps. This ornament's total beaded length including the metal cat angel is approximately 5-1/2" long. The personalized heart charm adds another approximate 2 inches. Add this piece as a wind-catcher focal, suspend with monofilament string to your car's rear-view mirror, clip the hammered copper ring to your purse (clip not provided) or add an ornament hook (provided) and dangle this piece from a place of your choosing. Please note that each metal ornament is unique. Please allow for slight variations in the hand-cut metal and note that the cutouts within the metal do leave a rough edge on the back. 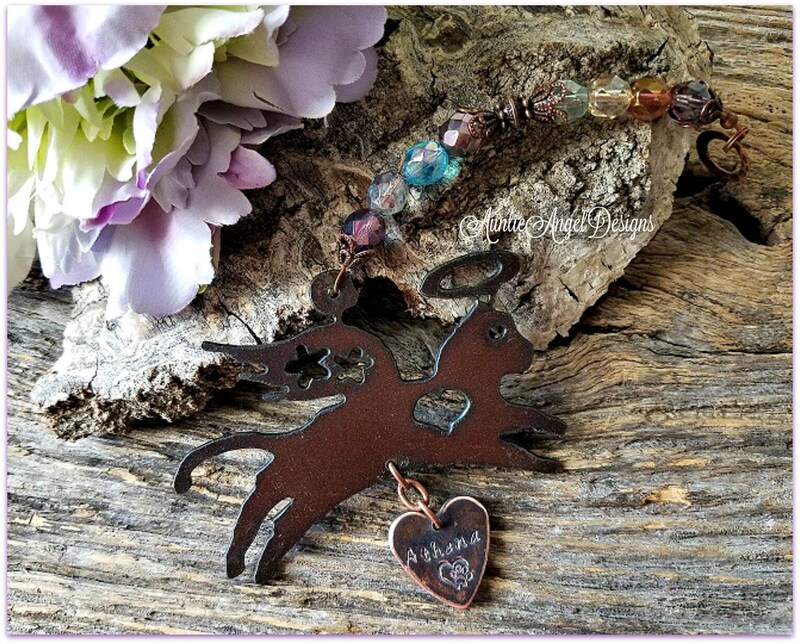 For an additional charge, I can personalize this piece with the furbaby's name stamped on a rustic patinaed copper heart charm. Only a name can be stamped -- 7 characters maximum across -- and on only one side of the heart. Note that this copper heart is NOT a perfect match to the ornament, but it is a nice complement to it. The patina effect will vary also from charm to charm, from front to back. As each letter is hand-stamped by me, letter by letter, alignment and spacing may, and most likely will be, slightly off, which is the beauty of a custom hand-stamped piece. The name will NOT look like it has been engraved by a machine. I finish the heart charm with a cute open heart-paw print stamping. If I am sending this gift for you, please fill out the free Etsy gift card section during the checkout process and be sure to "sign" your name to the message. 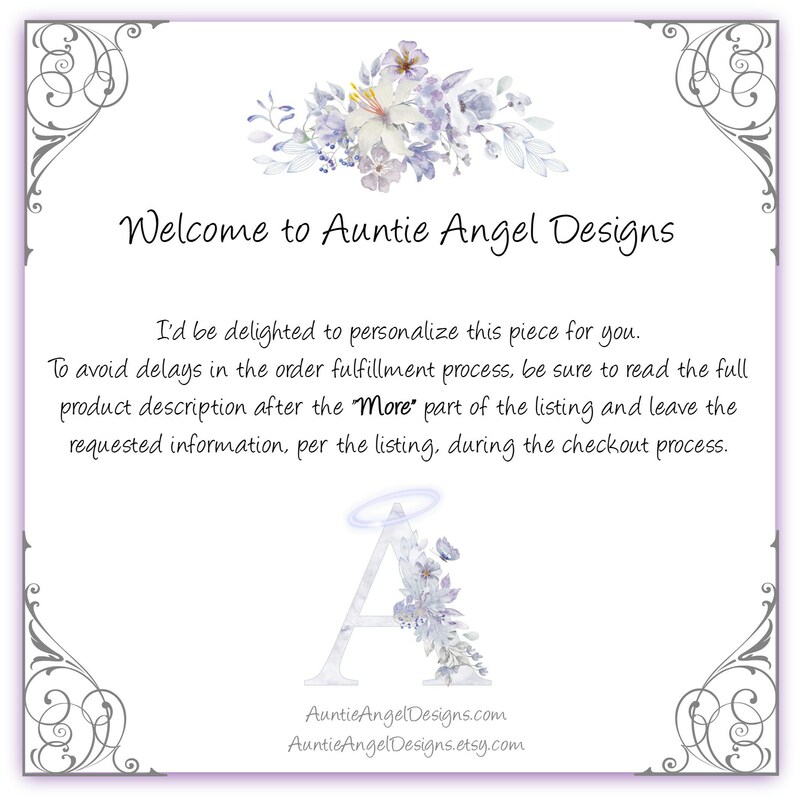 If the gift is being shipped directly to you for you to give to your friend or loved one, be sure to click that this is a gift during the checkout process and I will include a blank gift enclosure card and envelope. We absolutely love it. Jasper’s memorial ornament will go on the front top of the tree so it can be properly appreciated. I have to thank the creator so much for the thoughtful message and gift that she included, it really made our hearts swell. My friend loved this special ornament in memory of her cat. Beautiful work, and always my go to gift! These special ornaments are the perfect gift for someone who has lost a pet. Thank you!